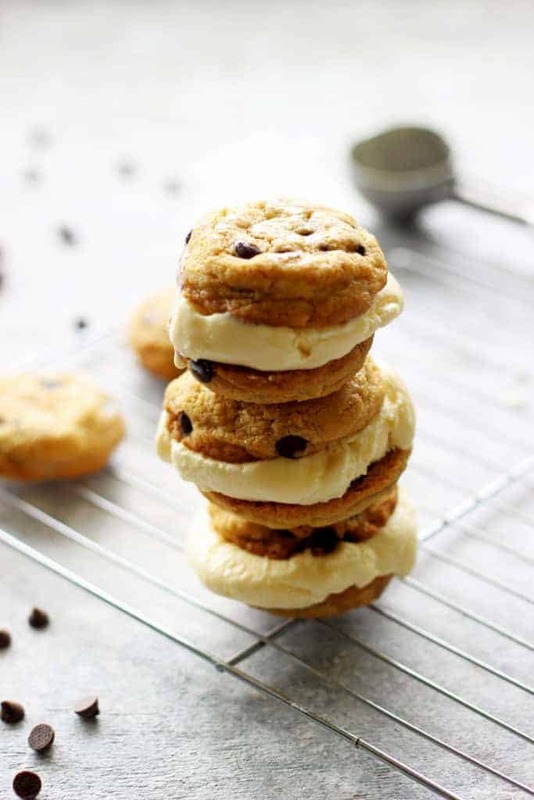 How to turn chewy homemade chocolate chip cookies and no-churn vanilla ice cream into the best ice cream sandwiches! A great dessert for summer, BBQ’s or kids birthday parties! How good is summer?! For the last few weeks our days have looked something like this. Wake up. Have breakfast including homemade granola and yoghurt with ALL the best summer fruits and berries. Sunblock, hat and into the pool. More food. Nap time. Popsicles or homemade lemonade turned into ice-blocks. Back into the pool. Dinner and bed. Repeat for infinity please because summer is the greatest. 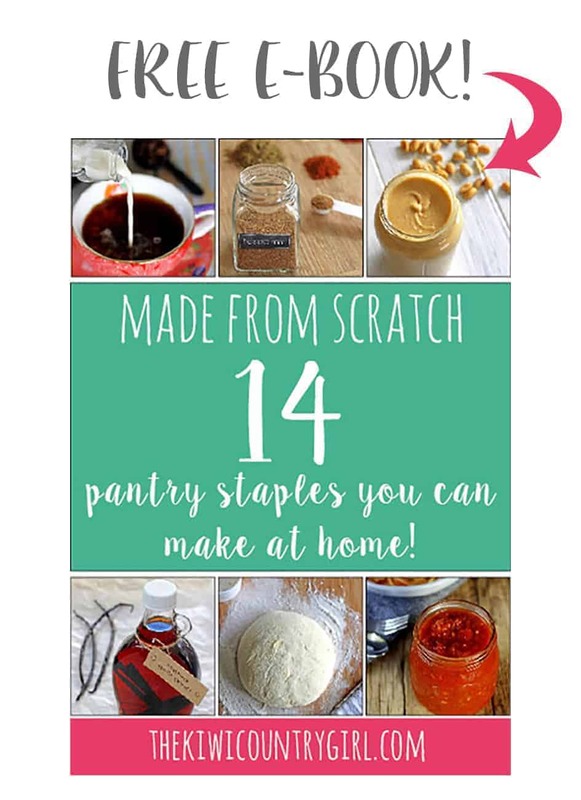 Click here to pin this to your desserts recipes board on Pinterest. Things that I don’t love about summer include flies, having to wear a hat now because I’m supposed to be setting a good example (eye roll) and trying to take photos of ice cream sandwiches in the middle of the day because the light is good but in actual fact they turned into melty messes and Sadie was waiting in the wings trying to snag all the chocolate chips from the shot. But it was a small price to pay to give you the recipe (will we call this a recipe??) or rather, inspiration to make what is quite possibly my new favourite summer dessert and is totally homemade from only two elements. The best ever chewy chocolate chip cookies. Firstly, you can make them in jars which means that when you are ready to bake you just have to melt butter, whisk in an egg and vanilla and then dump the pre-prepared contents of a jar into the bowl and mix. Sweet! 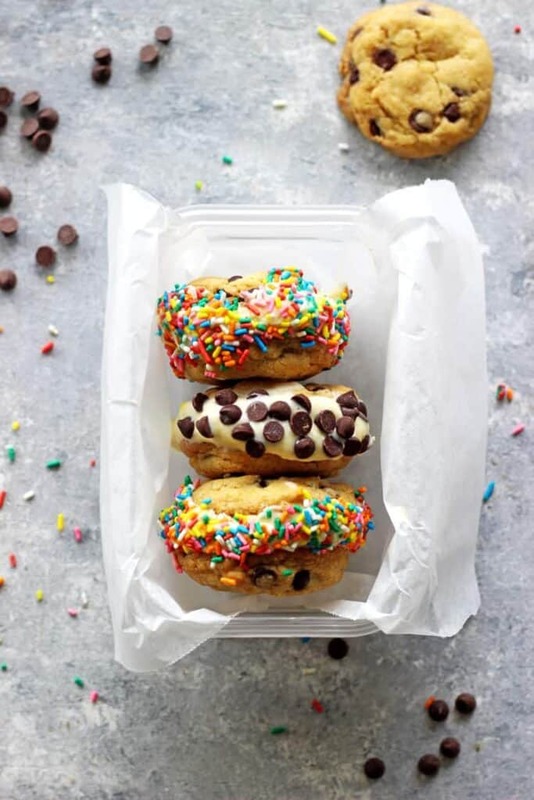 Except that for these ice cream sandwiches, we make mini cookies. Because in each sandwich, you get two cookies which equals one real life cookie PLUS ice cream. And if you need more, just eat another one! The easiest no-churn vanilla ice cream. Whip the cream, add condensed milk and vanilla and freeze. Done!! Creamy, delicious and the perfect filling for ice cream sandwiches. 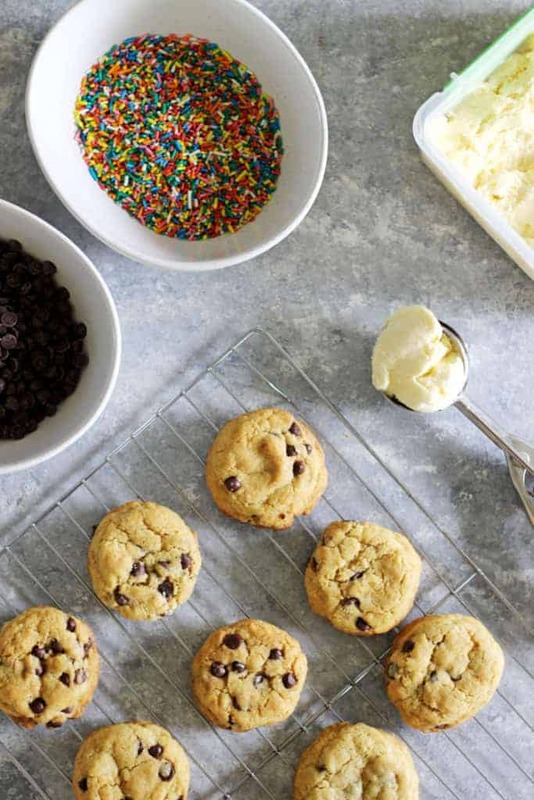 Freeze the cookies first – especially if you are making them in summer! This helps the ice cream stay cold while you are putting them together. Make one, and put it in the freezer while you make the next one. 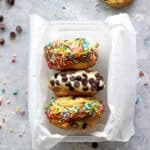 Once assembled, let them set in the freezer for a couple of hours before rolling them in sprinkles or chocolate chips. Again, this might not be a problem in winter but in summer, letting them freeze properly is super helpful! I’ve read that individually wrapping them in glad wrap or baking paper helps them freeze faster, but I haven’t tried this. If you are making several for serving at a party, wrapping in baking paper would be an easy way to serve them. Once mine were assembled, I rolled them in sprinkles and chocolate chips. This step is totally optional, but makes them look SO pretty don’t you think?! Freeze them on a tray or in an airtight container until you are ready to eat them and then ENJOY! They are the perfect summertime treat! In a separate bowl mix together condensed milk and vanilla. Fold through the whipped cream until well combined. At this stage if you wanted to add any extras such as crushed Oreos, chocolate chips or other colours or flavours, add them now too. Pour into a freezer proof container and freeze for at least 6 hours or until firm. Store in the freezer. Preheat the oven to 180°C/350°F and prepare two baking trays with baking paper or silicone liners. Set aside. Melt the butter in a large pyrex jug in the microwave or in a large pot on the stove. Add the sugars to the melted butter and whisk together. Add the egg and vanilla and whisk again. Add the flour, baking soda, salt and chocolate chips and mix together well until all ingredients are incorporated. Spoon 24 even sized scoops onto the prepared baking trays – I like to use a small ice-cream scoop to make sure they are all the same size. Bake for 8-10 minutes until cookies are just starting to go brown. Allow to cool on the tray for 10 minutes and then transfer to a cooling rack. Match up the cookies in pairs with another one that is similar shape and size to it (this makes the sandwiches look more uniform. Place them together and freeze for about an hour until firm. This will make it easier to assemble the sandwiches. 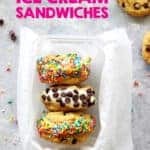 Prepare a tray or container that can go back into the freezer with the assembled ice cream sandwiches on it. Remove the cookies and the ice cream from the freezer. 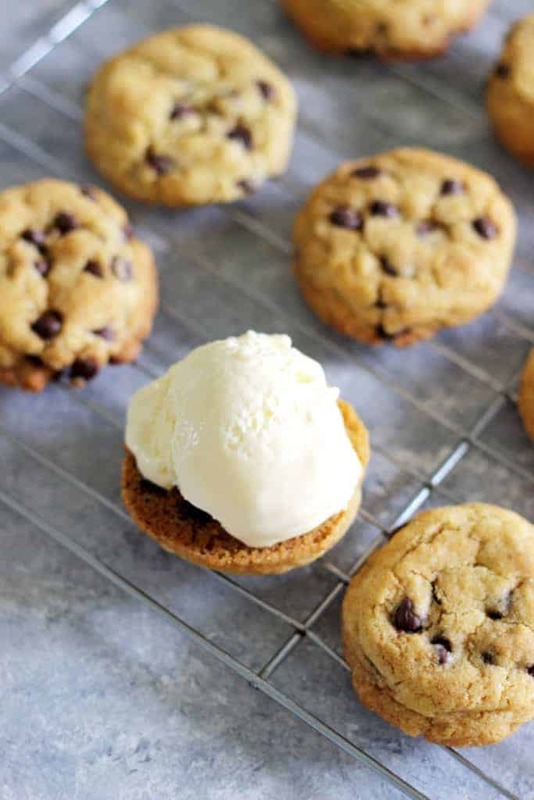 Place a scoop of ice cream on the flat side of one of the cookies (enough to almost cover the cookie). Take the matching sized cookie and place it on top, and gently squeeze together. Place the sandwich back on the tray and into the freezer. Repeat with all remaining cookies. 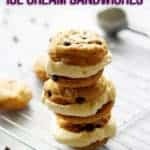 Freeze until the ice cream has firmed up and then roll each sandwich in sprinkles or chocolate chips if desired. 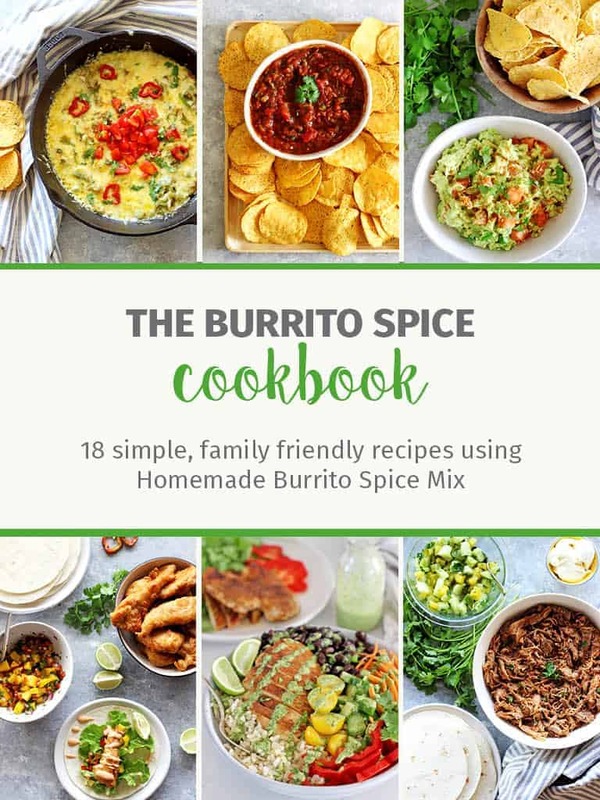 If you are serving them individually, this is a good time to wrap them in glad wrap or baking paper and then put them back in the freezer until ready to serve.